An Apostle is one who is sent out by our Lord Jesus Christ to spread the gospel that he is the Messiah, that he is risen, and that we are being saved as a result. The word apostle comes from the Greek αποστολος, literally meaning "one who is sent out." Originally a military term referring to a sortie sent out against the enemy, apostle has in the Christian context come to refer to a missionary spreading the gospel of Jesus Christ. Our Lord originally appointed twelve apostles as his initial Church community, commissioned with the task of sharing the faith. As told in the Gospels, Judas Iscariot was originally one of them, but with his apostasy and death, he was replaced with Matthias. Their collective feast day is June 30. The Apostles' names are listed at Matthew 10:2, Mark 3:14, Luke 6:12, Acts 1:13, 26. The chosen disciple, together with Paul and the entire company of the Twelve. We glorify him who has glorified them! 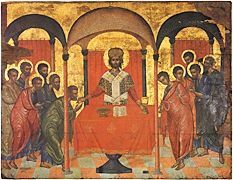 The Seventy Apostles are those whom the Lord chose (described in Luke 10:1-16) in addition to the Twelve and sent forth to assist in the work of preaching. Over time, the Twelve added others to their number, who were sent out with the original Seventy to preach the gospel. Although this number eventually exceeded seventy, they were all nevertheless referred to as "of the Seventy" out of reverence to the number which the Lord originally chose. Their collective feast day is January 4. Achaicus, Agabus, Alphaeus, Amplias, Ananias (who baptized Paul), Andronicus, Apelles, Apollo, Apphia, Aquila, Archippus, Aristarchus, Aristobulus, Artemas, Asyncritus, Barnabas (leader of the Seventy and companion of Paul), Caesar, Carpus, Cephas, Clement, Cleopas (who accompanied the Lord to Emmaus), Crescens, Crispus, Epaphroditus, Epenetus, Erastus, Evodus, Fortunatus, Gaius, Hermas, Hermes (bishop of Dalmatia), Herodian (Rodion), James (the Brother of God, also called "the Less"), Jason, Junia, Justus (brother of the Lord), Linus, Lucius, Luke the Evangelist (companion of Paul and author of the Gospel that bears his name), Mark the Evangelist (companion of Paul and author of the Gospel that bears his name), Narcissus, Nicanor (one of the original seven deacons), Olympas, Onesimus, Onesiphorus, Parmenas (one of the original seven deacons), Patrobas, Philemon, Philip (one of the original seven deacons), Philologos, Phlegon, Prochorus (one of the original seven deacons), Pudens, Quadratus, Quartus, Rufus, Silas (companion of Paul), Silvan, Sosipater, Sosthenes, Stachys, Stephen the Protomartyr (one of the original seven deacons), Symeon, Tertius, Thaddeus (sometimes confused with Jude of the Twelve), Timon (one of the original seven deacons), Timothy (companion of Paul), Titus, Trophimus, Tychicus, Urban, Zacchaeus, and Zenas. the choir of the seventy disciples of Christ. for they are divine lamps of the Faith. The Apostle Paul (June 29) is also referred to as an apostle, though he is not one of the Twelve or of the Seventy. 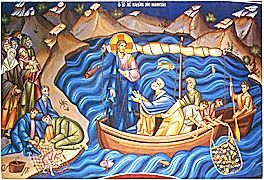 Other missionary saints are also referred to as apostles, though usually not as an initial title, but rather as an epithet, e.g., "Apostle to the North" (though some regard this usage as not traditionally Orthodox). Further, other saints have the epithet "Equal-to-the-Apostles" (in Greek, Ισαποστολος), usually because of their significant work in building up the Church. 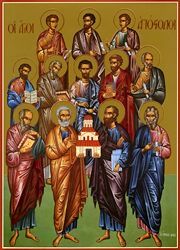 St. Paul shares the collective feast day with the Twelve Great Apostles. He was beheaded in Rome during the reign of Emperor Nero. This page was last edited on May 15, 2011, at 02:55. This page has been accessed 221,897 times.